Britain’s largest bank, HSBC, enabled drug cartels to wash their billions of tear- and blood-soaked dollars through its global operations, a U.S. Senate subcommittee reported in August. HSBC netted billions in profits as result. The bank is now negotiating with the U.S. Department of Justice in hopes of settling the department’s ongoing investigation into HSBC’s money laundering scheme. The bank has put aside $1.5 billion for expected fines, and could face criminal charges for illegal operations with connections to drug mobs and terrorists. HSBC is linked to Mexico’s Sinaloa cartel, which according to reports, was the cartel favored by both U.S. and Mexican officials “on the theory that if there were just one cartel, things would be more peaceful.” An estimated 120,000 people in Mexico have been killed since 2006 as a result of “war on drugs”-related violence, Paris-based Le Monde estimated. The war on drugs has also cost lives in the U.S. through addiction, imprisonment and gang violence. In Chicago’s western suburbs and towns, teenagers and young adults have succumbed to heroin addiction in record numbers. Parents of young addicts have been organizing to educate the wider community about the disease of addiction. One parent took it a step further by recently speaking out on the banks’ connections to drug cartels. 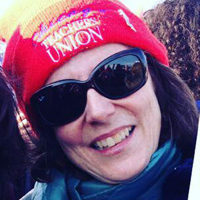 Luci Sabala, a mother from Naperville, Ill., posted a homemade video on Facebook entitled, “Drugs in the Western Suburbs; financial institutions linked to drug trafficking.” With “He’s My Son” playing as background music, Sabala splices photos of her son growing up with stories about HSBC’s money-laundering operations. Sabala’s son is struggling with heroin addiction. Sabala says she may lose her house to foreclosure due to all the medical bills trying to get her son help. Her mortgage holder? HSBC. Sabala insists this is not an individual family’s problem, but something bigger and more sinister. She expressed outrage that financial institutions are profiting from illegal drugs. “The banks Wachovia, Wells Fargo & Co, HSBC and Bank of America have all been charged, indicted and paid hefty fines for laundering money through their banks to the Mexican drug cartel. The money laundering also included funds that went toward weapons to the Middle East and linked to Al Queda,” she said. In 2010, Wachovia Bank paid $50 million for breaking U.S. banking laws, the largest settlement ever for money laundering. The federal prosecutor in the case remarked, “Wachovia’s blatant disregard for our banking laws gave international cocaine cartels a virtual carte blanche to finance their operations.” Wachovia laundered $378.4 billion for the drug gangs. In an extensive article entitled “The Global Banking ‘Super-Entity’ Drug Cartel: The ‘Free Market’ of Finance Capital,” marketoracle.com blogger Andrew Marshall points out that Wachovia’s fine, plus $110 million in drug money it had to forfeit, was less than 2% of the bank’s 2009 profits. Wells Fargo swallowed up Wachovia during the monopolization frenzy triggered by the 2008 financial meltdown. When the Wachovia settlement was announced, Wells Fargo stock rose. The UN and International Monetary Fund estimate annual global profits from the drug trade at $600 billion. It is estimated the “financial services wing of the cartels” launder anywhere from $2 trillion to $3.6 trillion a year in funds connected to corruption, including tax evasion, drugs, arms smuggling and other criminal activity. Meanwhile, three counties in Georgia, Cobb, DeKalb and Fulton, recently filed suit against HSBC for predatory lending practices that specifically targeted African American and Latino homeowners. Baltimore and Memphis are suing Wells Fargo for the same. These banks – along with others – gouged, abused and ripped off borrowers with high fees and overpriced loans while doling out mortgages that many couldn’t afford. Martin Woods, who blew the whistle on Wachovia, told the London-based Observer, “New York and London … have become the world’s two biggest laundries of criminal and drug money, and offshore tax havens. Not the Cayman Islands, not the Isle of Man or Jersey. The big laundering is right through the City of London and Wall Street,” he said. In Naperville, Ill., Sabala wants people to see this connection so action to change it can be taken. 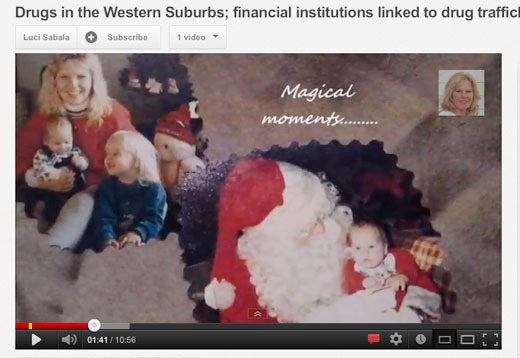 Photo: Screen shot of Luci Sabala’s video on YouTube shows family photos from a more innocent time.